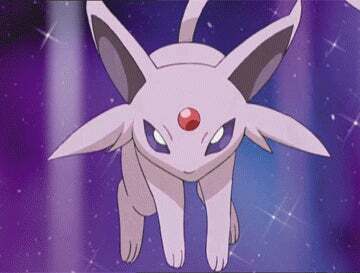 Enigmatic Espeon! Pokemon One a Day, Series 2! Your future...it is written! 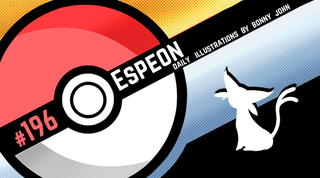 Today for One a Day, we reach a Pokemon who I've always loved - Espeon! Espeon reinvigorates my passion for the series and I went all out in response. I had the idea for a tarot card for a while, so I'm glad I could finally translate it into full visual form. This style is extremely fitting for a psychic type like Espeon. Fortunes and seeing into the future, reading the mind...all of that lead to a tarot card. I was inspired by many designs of cards and used references to build my own vision from real cards to fictional designs like that of Persona and Cardcaptors. For some reason, I saw a lot of gold so I used it for decadence. I brought in black to strike hard and strong against gold and positioned various elements to fit snug in the alotted space. I used google to get the background, fleur de lis like markings, and victorian themed backing for the edge of the card. Everything else was rendered and created in the usual Photoshop. I guess there isn't much else to say. I had a blast working on this one and it's the first time I feel passionate about the series again after the recent dumbass designs Nintendo pooped out that needed to be represented for the series. With the subject of tarots and fortune telling - would you ever go see a fortune teller in real life? Also, where do you see yourself in 5 years? P.S. Monday, we'll find out what Espeon is looking at...Enjoy your weekend!